I mentioned previously that when you smoke, you inhale up to 4,000 chemicals. 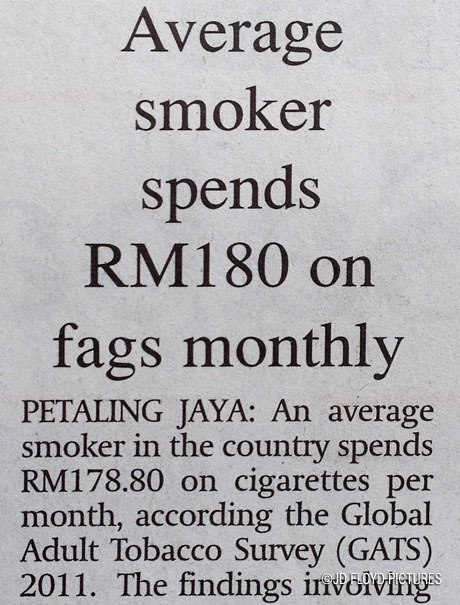 Bernama reported that an average smoker in the country spends RM178.80 on cigarettes per month. So, this is what GATS - Global Adult Tobacco Survey - says. It could be RM150 or RM500 monthly for some. The findings involving adult respondents aged 15 years and above were tabled at the GATS Malaysia Conference 2011 here Tueday, June 13. Speaking to reporters after opening the conference, director-general of Health Datuk Dr Hassan Abdul Rahman said the findings would be capitalised in drawing up the National Tobacco Control Action Plan in future. He said the study showed that 87.1% of smokers were aware of anti-smoking campaigns on television or radio while 45.8% of smokers were thinking of quitting due pictorial health warnings on tobacco packages. Dr. Hassan said 92.2% of respondents believed that smoking could cause serious illness while 85.8% believed that sniffing someone else’s cigarette smoke would cause serious illness. The survey involved cooperation between the Health Ministry, the World Health Organisation and the Centre for Disease Control and Prevention, Atlanta. - Bernama. Let's look at a scenario where the RM180 is deposited monthly into a fund manager (say ASB) account that gives 8% of dividend/bonus annually. From the Table, after 5 years you would have deposited (in this case spent/burnt) $10,800. Calculate the compound interest and you would have accumulated $13,685. After 20 years of burning fags, you can compare your spendings with those of someone's that are deposited instead. You would have accumulated $106,753; I would love to have that to pay for a nice vacation after 20 years of hardwork. But it's my money and it's my health not yours, you say. Indeed they are yours. I'm just sharing this with everyone and if it's pertinent to what you are looking for, or what you wanted to know, then this will be of benefit to you. Some would really want to quit smoking (and those includes my circle of friends) but there are also some who would vow to cling on to the addictive taste of fags no matter what. it isn't logical or reasonable to smoke...but I guess neither are a lot of things in life. I do not smoke, but never seemed to save a lot from that.